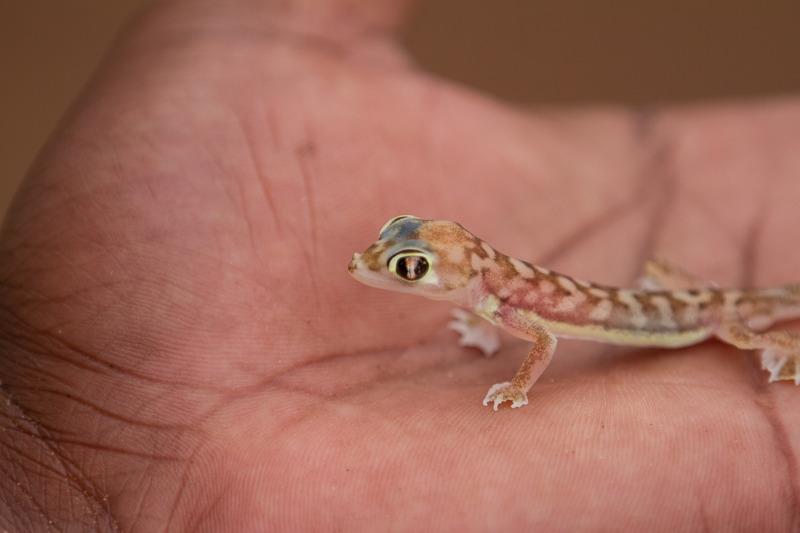 The Namib Web-footed Gecko is an adorable little lizard that isn't... all there. Perhaps that's not surprising given where 'there' is. These sweeties reach just 15 cm (6 in) or less long, about half of that being their tail. The other half consists almost entirely of eyeballs. Cute! Or abominable? There's a fine line when it comes to eyeballs. 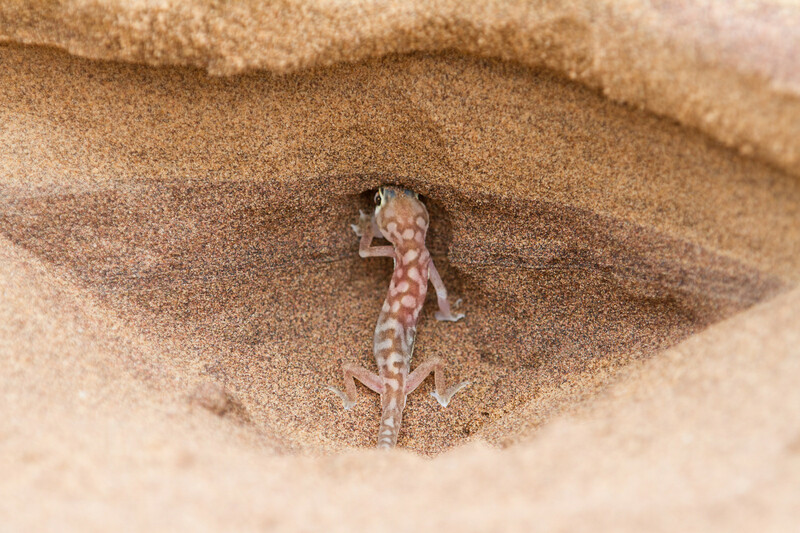 Namib Web-footed Geckos leave little to the imagination with their translucent skin giving a pretty clear view of their internal organs. I doubt most people would regard this as one of their cuter characteristics, but there's probably someone out there giggling with delight at the sight of a liver. You know what people are like. Their pink, translucent skin gives these geckos a certain spooky quality. It's as if they've travelled the multiverse and left a little piece of themselves in each reality. Maybe their eyes bulged at some astonishing sight and then the wind changed and they stayed that way. Take a beach. Sun, sand and sea, ice cream, palm trees and sand castles, the whole shebang. Now make it 1,000 miles long. Now make it 100 miles wide so that when you clamber onto shore from your morning swim, you see nothing but sand dunes extending into the distance. And all the ice cream has melted and evaporated. That's the Namib. It lies on the coast of southwest Africa, extending along the entire coastline of Namibia. It's the oldest desert in the world, being 55 or more million years old, so it's pretty experienced. It really knows how the desert gig works. Thus, it experiences about 1 cm (0.4 in) of rainfall per year. Yikes! On the other hand, the Atlantic Ocean is right there, so moist sea air gets blown into the desert all the time. Even an honest-to-goodness fog is common, so there's always water available if you know how to get it. Like almost all geckos, the Namib Web-footed Gecko lacks eyelids. Instead, a transparent scale covers each eyeball and has to be licked clean periodically to clear off any dust or dirt. In the Namib, those eyeballs get covered in more than just sand grains. Droplets of water condense on them, too, within easy reach of that thirsty tongue. Good thing those eyes are so big. You could probably water a garden with those things! But the Namib is still a desert. Any morning dew that might form on the baking hot, sun-drenched sand immediately evaporates. It's even hot enough to burn precious tootsies and feetsies. This is where the Namib Web-footed Gecko's web-footedness comes into play. Those feet are shovels! 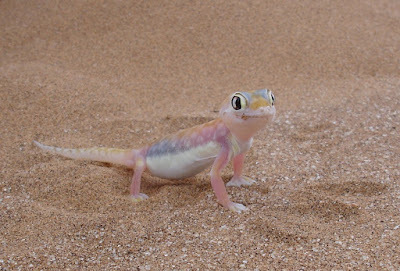 The gecko uses them to dig into the fine, loose desert sands. They spend the daytime up to a metre (3.3 ft) underground, far from the sun's rays, where the sand remains cool and comfortable all day long. They emerge at nightfall when temperatures drop precipitously. Seriously, some parts of the Namib can dip below freezing at night! But those webbed feet aren't snowshoes, they're sandshoes! 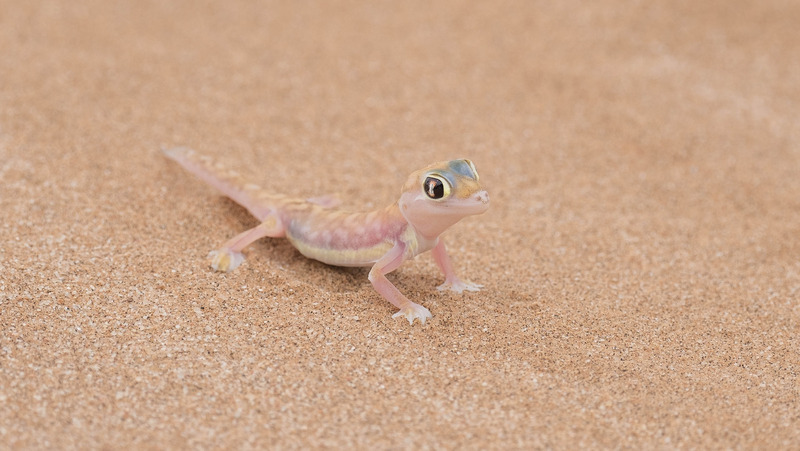 The Namib Web-footed Gecko scampers over the loose sands with ease, using those enormous eyes to spy out tasty crickets, beetles and other insects in the cool of night. Those shovel-feet come in handy (footy) when it comes to laying eggs, too. After all, a boiled egg is great for breakfast, not so much for hatchlings. 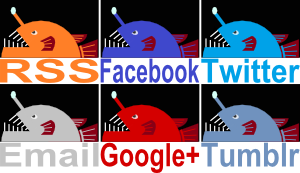 First thing's first, though, males and females have to find each other in the vast, dune sea. Luckily they're quite vocal and can find each other with an array of squeaks and croaks. After mating in April or May, the female lays a pair of eggs in an underground burrow. She's careful to find the perfect temperature and a bit of moisture too so that the little ones don't dry out. The eggs take about eight weeks to hatch and, in July to October, little babies emerge from the sand to find their first meal. Except, they aren't that little. Newly hatched Namib Web-footed Geckos are already 10 cm (4 in) long. They only have another inch or so to grow before they're as big as their parents! I guess it's easy to grow quickly when you're not all there. That's fine and cute and all but do they sell car insurance? Maybe! If you can survive the Trials of the Namib and find the gecko skulking in the darkness of night. And you thought finding a leprechaun was hard! Cold Sea Balloon... OF DEATH!